Home / Uncategorized / (WARHOL, Andy). 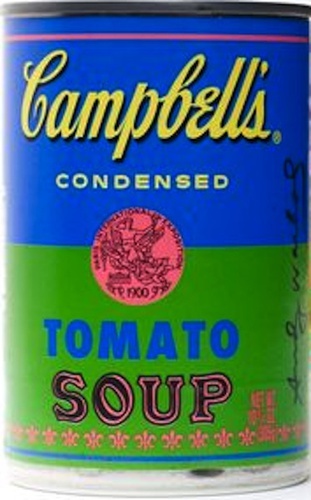 Campbells Condensed Tomato Soup. (Camden, NJ. ): Campbell Soup Company, 2012. One of a “limited” edition of 1.2 million issued to celebrate the 50th anniversary of the first showing of Warhol’s paintings. The cans, produced with the approval of (and a license from) The Andy Warhol Foundation, were sold exclusively at Target stores in the U.S. The four specially-designed labels reflect Warhols pop-art style and use vibrant, eye-catching color combinations, this example with the blue and green label and Warhol “The world fascinates me” quote The Campbell Soup Co.’s embrace of Warhol’s iconic imagery is a switch from its initial reaction, when the company considered taking legal action before deciding to see how the paintings were received by the public. A very good example of this iconic item.